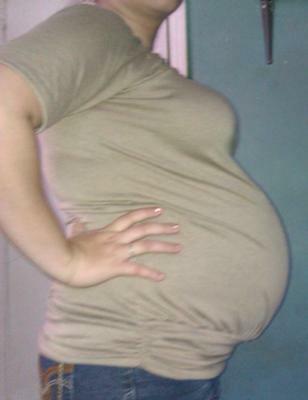 IM 25 WEEKS PREGNANT WITH BOY/GIRL (NAOMI AND NOAH) FRATERNAL TWINS AND I HAVE GAINED A TOTAL OF 30LBS SO FAR ..EEEEK!! I'VE RECENTLY GONE BACK TO WORK BUT IT WAS A BAD IDEA. MY FEET ACHE SO BAD AFTER WRK EVERY SINGLE DAY. BESIDES THAT MY BABIES ARE GROWING PERFECTLY AND ON TRACK! THE BOY IS HEAD DOWN RIGHT NOW AND MY GIRL IS STILL HEAD UP HOPING SHE'LL FLIP! I DO HAVE 2 OLDER BOYS AGES 6 AND 8 BUT I KNOW I CAN HANDLE ALL THE CHAOS THAT WILL B EXPECTED.